WORDS: BIOG: Dalton, John, D. D.
was born in 1709, at Deane, in Cumberland, where his father was then rector. He had his school education at Lowther, in Westmoreland, and thence was removed, at the age of sixteen, to Queen’seollege, in Oxford. When he had taken his first degrees, he was employed as tutor or governor to lord Beauchamp, only son of Algernon Seymour, earl of Hertford, late duke of Somerset. 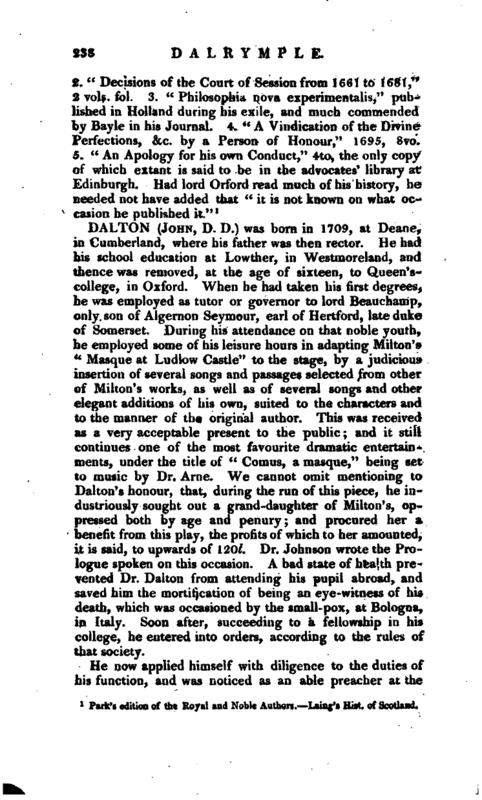 During his attendance on that noble youth, he employed some of his leisure hours in adapting Milton’s “Masque at Ludlow Castle” to the stage, by a judicious insertion of several songs and passages selected from other of Milton’s works, as well as of several songs and other elegant additions of his own, suited to the characters and to the manner of the original author. This was received as a very acceptable present to the public; and it still continues one of the most favourite dramatic entertainments, under the title of “Comus, a masque,” being set to music by Dr. Arne. 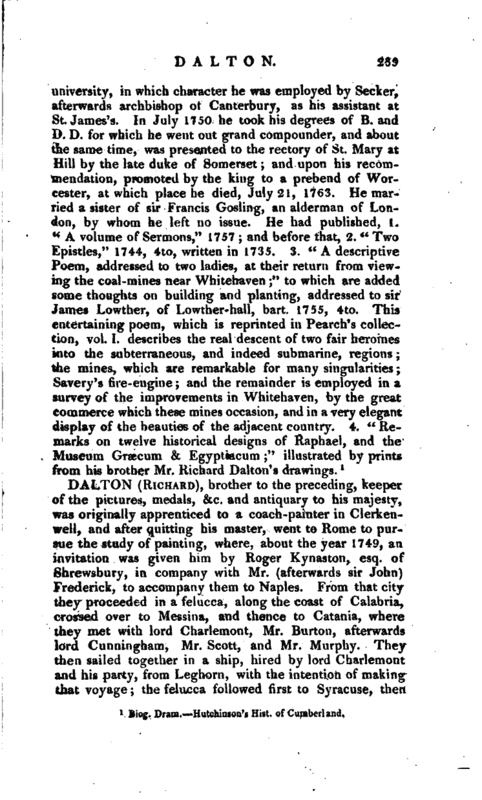 We cannot omit mentioning to Dalton’s honour, that, during the run of this piece, he industriously sought out a grand-daughter of Milton’s, oppressed both by age and penury; and procured her a benefit from this play, the profits of which to her amounted, it is said, to upwards of 120l. Dr. Johnson wrote the Prologue spoken on this occasion. A bad state of health prevented Dr. Dalton from attending his pupil abroad, and saved him the mortification of being an eye-witness of his death, which was occasioned by the small-pox, at Bologna, in Italy. Soon after, succeeding to a fellowship in his college, he entered into orders, according to the rules of that society. Biog. Dram. Hutchinson’s Hist, of Cumberland.